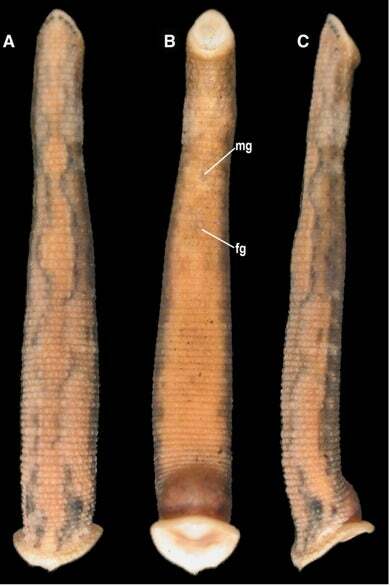 Scientists at the American Museum of Natural History in New York have named a new species of leech after Amy Tan, bestselling author of such novels as The Joy Luck Club and The Bonesetter’s Daughter. They also completed a CT scan of the tiny creature—the first time the technique has been used on a microscopic soft-bodied specimen. Chtonobdella tanae hails from Queensland, Australia, and lacks any kind of shell or exoskeleton, making it particularly challenging to capture via CT scanning. The researchers describe their work in a new paper in the journal Zoologica Scripta. CT scanning is a lot like standard x-ray imaging, except the machine takes lots of sectional slices from various angles of the object being imaged. The result is a high-resolution 3D image of the object’s interior. Because it uses x-rays, bone (which is very dense) shows up in sharp contrast in the resulting images. This is great if you’re studying vertebrates like dinosaurs or lizards, for example. But soft tissue—like the stuff that makes up worms or jellyfish (or leeches)—isn’t as dense, and thus doesn’t show up very well in CT scans. That’s why researchers typically rely on traditional dissection to get a good look at the insides of their invertebrate specimens. It’s less precise, however, and usually destroys the specimen, unless a scientist painstakingly reconstructs the creature. It would be nice to have the non-invasive CT option available for soft-bodied creatures as well—especially those, like Chtonobdella tanae, that are just too small to dissect. The trick is to figure out how to enhance contrast. The AMNH team tested various chemical preservatives on North American freshwater leeches, and found that the best option was to first fix the leech in a mixture of alcohol, formalin, and acetic acid, and then refix it using osmium tetroxide. The latter contains a heavy metal (osmium), and through this two-stage process, it binds to internal tissues. Voila! Instant contrast enhancement! It proved just the ticket for imaging the tiny Chtonobdella tanae. And why did they name the creature after Amy Tan? Not only is Tan a longtime supporter of the AMNH, she makes frequent reference to these tiny leeches in her 2005 novel, Saving Fish from Drowning. The researchers figured she would see the humour in it, and recognise the intended honour. Images: (top) Internal structure of Chtonobdella tanae. (bottom) External imaging of Chtonobdella tanae. Credit: Tessler et al., 2016.